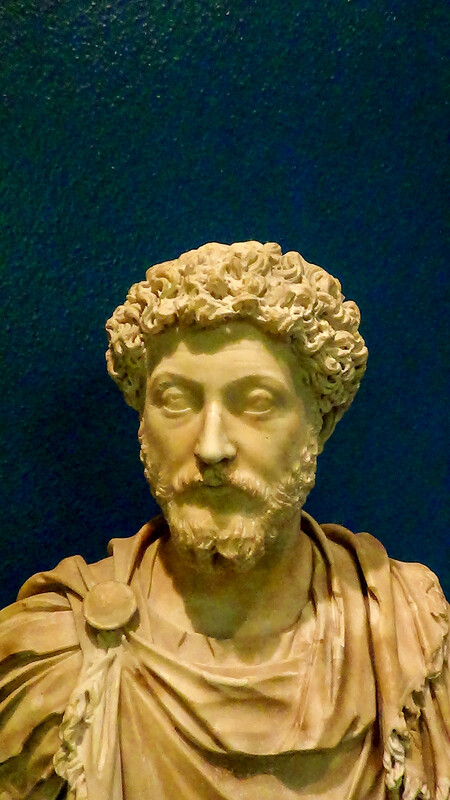 Marcus Aurelius, Emporer and Philosopher, reigned from 161 to 180 AD. He was born in 121 in the province of Iberia (Modern day Spain) into a patrician family. In 136 Emporer Hadrian adopted Marcus’ father in law as his successor, but he died only 2 years later. The Emporer then appointed Aurelius Antoninus, Marcus’ uncle, as his new heir and Antoninus adopted Marcus and Lucius Verus as his heirs. Hadrian was very sick at this time and only 6 months after making the appointments he died and Antoninus took the Imperial throne in his place. In 139 and 140, Marcus served as Consul, having avoided the normal route of advancement by being the heir of the Emporer. Marcus the consul struggled with the life and duties of court yearning for time for his reading and studies. Antoninus died in 161 and Marcus he became co-Emporer with Lucius Verus, even though the Senate wished him to be sole ruler. Lucius Verus died in 169 and Marcus roled as sole Emporer. During his reign, he defeated the Parthian Empire and was successful in the Marcomanic Wars against the Germanic tribes. But he still found time to write about his philosophical beliefs. In addition to his military and scholastic renown, he was also a good administrator and lawyer. Marcus died in March 180 and was succeeded by his son, Commodus, with whom he had ruled jointly since 177. Marcus Aurelius is regarded as being the last of the 5 Good Emporers and many historians take his death and the ascension of his son as being the start of the decline of the Roman Empire.